On predefined and agreed upon timetables, he touches base with these people and reflects upon how he’s doing across various domains of his life – how he’s engaging in his own self-care and self-renewal, how he’s doing as a husband, how he’s doing as a father and family member, how he’s contributing and giving back to the world at large, and the current projects he’s working on to cultivate these areas. I found this idea of a peer mentorship team to be super exciting. (and it makes me wonder how many high-functioning people already have something like this in place.) Though I have caring relationships like these, I never thought to treat them as a chosen assembly of people that would become an infrastructure for my health and well-being. I’ve been evaluating my own weaknesses the last few weeks with honesty and vulnerability, and deciding who I will ask to help support me on life’s path. Below (and in image above) is a poem/call to action he dictated during our chat, which I jotted down for future inspiration. Enjoy! 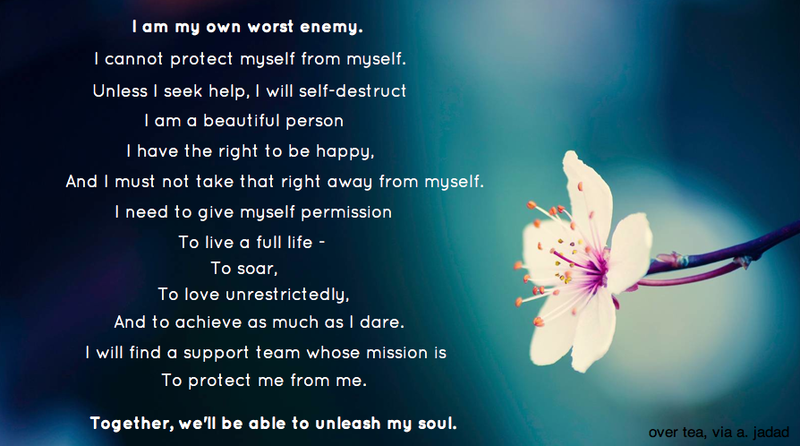 I cannot protect myself from myself. Unless I seek help, I will self-destruct. And I must not take that right away from myself. And to achieve as much as I dare. To protect me from me. Together, we’ll be able to unleash my soul.